After recently watching the documentary "King Corn" by filmmakers Ian Cheney and Curtis Ellis, the state of the nation’s, and in turn the world’s food supply was on my mind. Why has industrial corn - used for derivative food ingredients and now comprised almost wholly of genetically modified varieties - become such a huge part of our lives? Apparently much of the reason for the rise of corn is tied with Big Agra business and a Secretary of Agriculture named Earl Butz, who was appointed to office under President Nixon and kept under President Ford. In doing some basic research on Butz, I encountered not only his scandals over racial remarks or his mocking of the Pope for not backing overt population control, but the file stubs of LaRouche PAC, who heavily covered his involvement in Ford Administration affairs and his controversial role at the key 1974 United Nations World Food Conference, which set up the World Food Council (suspended in 1993), derived from a Rockefeller proposal for a World Food Bank. 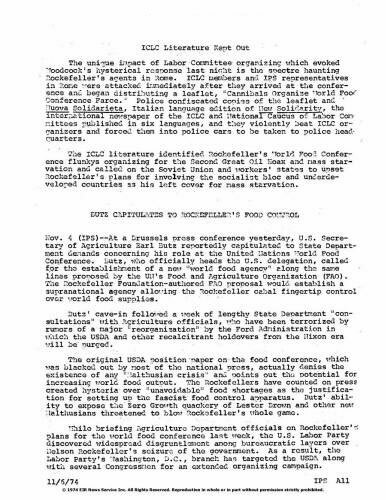 Just weeks before Nelson Rockefeller would be appointed Vice President of the United States, the Rockefeller machine had been threatening administration officials held over from the Nixon Administration to go along with the agenda, including that of a world food authority. One of those figures was Earl Butz, who according to LaRouche press releases at the time, was targeted in the New York Times and pressured by attacks from ranking political figures including Nixon’s opponent and Democratic presidential candidaten George McGover. The result, reported below in a vintage LaRouche publication, details how Secretary of Agriculture Earl Butz "capitulated" to these demands during his role at the November 1974 UN World Food Conference in Rome, reversing his position, and backing the "Malthusian" eugenics views on controlling the world food supply in conjunction with efforts to limit the population. Butz, who officially heads the U.S. delegation, call for the establishment of a new "world food agency" along the same lines proposed by the UN’s Food and Agricutlure Organization (FAO). 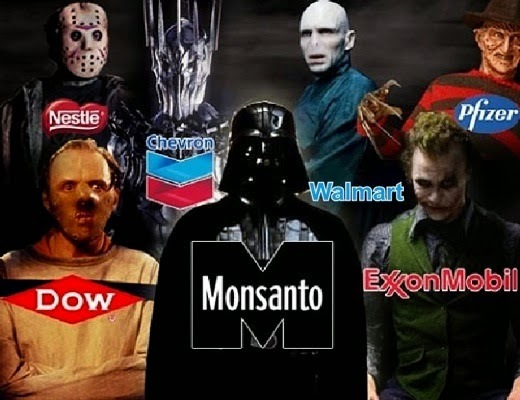 The Rockefeller Foundation-authored FAO proposal would establish a supranational agency allowing the Rockefeller cabal fingertip control over world food supplies. This remains highly significant, as Butz remained through the Ford Administration and frequently consulted with the President and National Security Advisor and Secretary of State Henry Kissinger on food aid policy, food prices and production, among other matters. Significantly, just one month after the pivotal 1974 United Nations World Food Conference, Henry Kissinger officially issued the National Security Council document "National Security Study Memorandum 200 - Implications of Worldwide Population Growth for U.S. Security and Overseas Interests" (NSSM 200 for short). 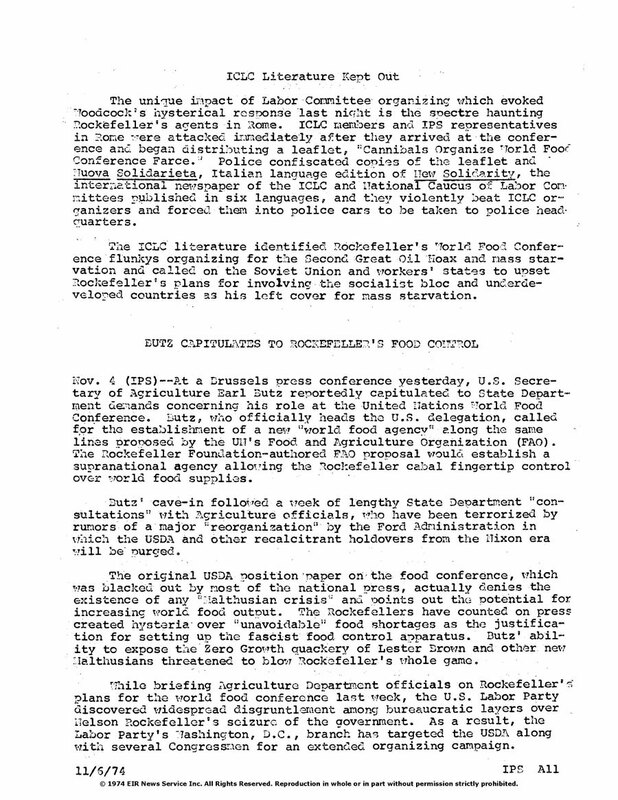 This document, which was also heavily analyzed by LaRouche PAC, called for using "food as a weapon" to aid in Third World depopulation efforts. The document specifically identified 13 key countries for depopulation as a top priority under national security interests. One part of the proposal discusses withholding food aid to induce population reduction and family planning on the basis of food shortages. "It is questionable whether aid donor countries will be prepared to provide the sort of massive food aid called for by the import projections on a long-term continuing basis," suggesting that Western nations might opt out of giving rations to countries that have not followed international programs to cut population numbers. "Mandatory programs may be needed and we should be considering these possibilities now," adding in NSSM 200, "Would food be considered an instrument of national power?… Is the U.S. prepared to accept food rationing to help people who can’t/won’t control their population growth?" The veiled threat is clear as Kissinger, a top Rockefeller envoy places a high priority on reducing population, is directing U.S. foreign policy, in the name of national security, to essentially blackmail countries into compliance with "family planning" programs to implement contraceptives, sterilizations and abortions to reduce the birthrate with the leverage of food supply and food aid. "There is also some established precedent for taking account of family planning performance in appraisal of assistance requirements by AID [U.S. Agency for International Development] and consultative groups. Since population growth is a major determinant of increases in food demand, allocation of scarce PL 480 resources should take account of what steps a country is taking in population control as well as food production. In these sensitive relations, however, it is important in style as well as substance to avoid the appearance of coercion."